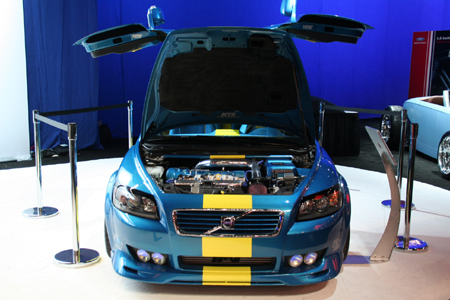 This trio of Volvo C30 concepts greets every person entering the Ford display at the 2006 SEMA show. 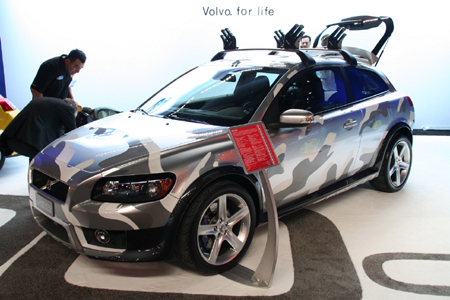 Our favorite by far was the C30 by Evolvo that's powered by a sequentially turbocharged version of the normal C30's 2.5-liter in-line five-cylinder engine, but producing 507 hp and 468 ft-lbs. 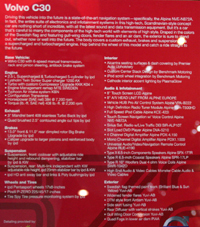 of torque in its SEMA form. The rear two wheels have also been invited to the drivetrain party so that all four 19-inch Evolve "F1" Multipiece wheels (13-inch wide rears, as you can see) can be driven mad by the monster motor. 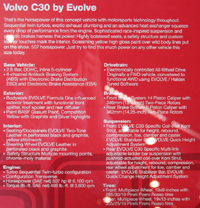 The bodywork on the Evolve is particularly impresive. After the jump you can see that the C30's schnoz has been lengthened 6 inches and adjustable front splitters now flank the mighty nose. Out back the body has been widened to accomodate the larger rear wheels, which created a space above the rear fenders where Evolved rerouted the exhaust outlets. Very trick, very nice. 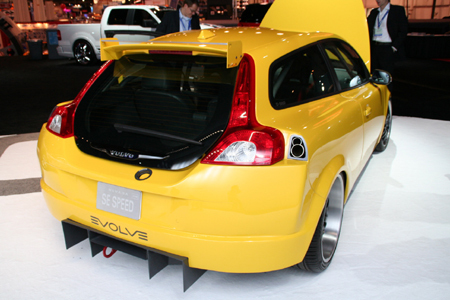 There's also a serious spoiler perched atop the C30's signature hatch and a real, functional air diffuser below. 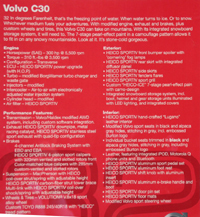 Check out the Heico C30 and the 400-horsepower ipd C30 with gull-wing doors. The latter looks like it's doing a passable impression of a Subaru Impreza Rally car.